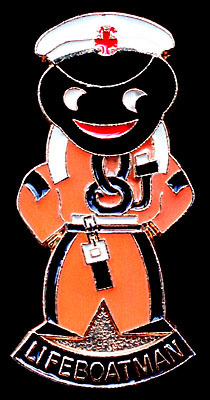 The lifeboatman was issued in 1988. Robertson's and the R.N.L.I. (Royal National Lifeboat Institution) got together to produce a limited edition of 25,000. At that time they were sold for £1.15 and two golly tokens. For every brooch sold 15p was donated to the R.N.L.I. charity. The brooch was hand enamelled and distributed in a presentation box. The reverse of the brooch can also be examined. 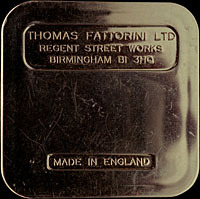 Each brooch came complete with a uniquely numbered certificate and presented diagonally in a plastic box mounted on foam.